The Pittsburgh Penguins put together a dominant performance on Saturday and dispatched the New York Rangers with a 6-3 final score in Game Five of their Eastern Conference playoff series. Pittsburgh took the series 4-1 and will face either the Washington Capitals or Philadelphia Flyers in the next round. The Penguins have struggled against the Rangers in the past, including two years ago when they watched a 3-1 series lead evaporate. But this year, Pittsburgh is running on all cylinders and New York just couldn’t pull it together. Part of the problem, believe it or not, was Henrik Lundqvist. The seemingly superhuman Rangers goalie looked decidedly human, especially over the past two games. He allowed a combined 10 goals on 41 shots and was pulled from each of the past two contests, with netminder Antti Raanta taking over. Lundqvist posted a 4.39 goals against average and a .867 save percentage in five starts. Part of the problem, the New York goalie said, was that the Penguins got too many scoring chances. The Penguins outscored the Rangers 21-10 in the series, with Pittsburgh somehow making good on their goalie troubles. They were without Marc-Andre Fleury and got three straight wins out of rookie Matt Murray, who even picked up a shutout and finished with a 1.33 goals against average and a .955 save percentage. Jeff Zatkoff started the series and put up a 1-1 record with a 3.08 goals against average and a .908 save percentage. The Penguins got big numbers from their big guns, too. Sidney Crosby led the charge with eight points in five games, including three goals, and Evgeni Malkin found his stride with seven points in four games. Phil Kessel picked up three goals and three helpers in five contests and he registered 20 shots on goal in the series. Kris Letang, Patric Hornqvist and Nick Bonino all registered five points. 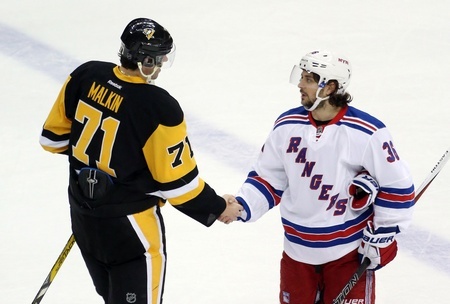 In the end, the Penguins proved that their depth was too much for the Rangers to handle. New York had been able to win at least one round in each of the past four seasons, but it was not to be this time around and the core group may be in need of some evaluation.